Experiencing Back or Neck Pain? What's The Cause? How Do You Treat It? Let Us Show You. Pinpointing the source of your pain helps narrow down the cause of concern and the best treatment for that cause. These locations are treated differently and are the regions in which we treat. A disc bulges when the outer layer of a vertebral disc swells outward and places pressure on the surrounding nerves and structures. Although a bulging disc is similar to a herniated disc, it is different in that the inner material has not seeped out through the outer layer of the disc. A bulging disc will usually occur in the lower back or the neck, but may also very rarely be found in the mid back. Symptoms of Carpal Tunnel Syndrome are felt in the lower arms and hands. Symptoms include numbness, tingling, pain that radiates along the nerve path, and a sensation of pins and needles. The longer the nerve remains compressed the more chance there is that permanent damaged may occur. Because of this it is important to seek treatment as soon as the condition is diagnosed. Coccydynia is a medical term for the pain caused when you sit down abruptly placing too much pressure on your coccyx and damaging it. 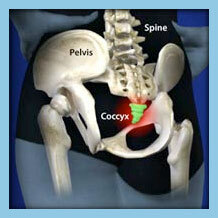 Damage to the coccyx is difficult to heal and sometime will not heal completely. Because this bone is not needed in our body, sometimes it is easiest just to remove it to alleviate the pain from a traumatic fall if conservative treatment methods fail. Degenerative disc disease refers to spinal degeneration occurring as we age. It's really not a disease but a set of circumstances that leads to the breakdown of the vertebral disc and surrounding structures. Degenerative disc disease usually starts to show itself as we age and the stresses we have put on our back over the years start to take their toll. A disc tear usually happens when there is a combination of disc degeneration and trauma to a vertebral disc. When a disc tear occurs the inner disc material pushes into the tear creating a form of disc herniation. Occasionally the material will pass completely through the outer layer of the vertebral disc leading to a full disc herniation. A condition where the hip joint socket is abnormally shallow predisposing the labrum and cartilage to abnormal wear and tear and early arthritis. Facet joint disease is a condition that occurs in the spine and develops over many years as the facet joints begin to break down through every day wear and tear. 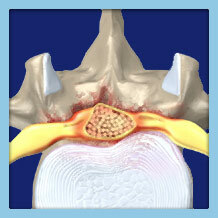 The facet joint can become painful with a single traumatic episode. Facet joint disease is more commonly found in the areas of the spine where there is more movement (bending and flexing). It usually occurs in the neck or lower back. Failed back or neck surgery occurs when a previous surgery has failed to provide results that would reduce or completely alleviate the patients back pain. Failed back and neck surgery is often a result of improper diagnosis, failed fusion, or lack of experience on the operating surgeons part. Foraminal stenosis refers to the narrowing of the vertebral foramen whether it be from debris or other conditions. When the foramen begins to narrow, the nerves exiting it can become compressed leading to painful symptoms that are felt in the area as well as either the arms or legs. Foraminal stenosis can occur anywhere along the spine but is most commonly observed in the neck or lower back. A herniated disc is a vertebral disc that has broken down to the point where the inner material, called the nucleus, has seeped through the wall of the vertebral disc and causes pain in the surrounding structures or nerves. A herniated disc can occur in the lower back, the neck, and rarely in the mid back. A disorder of the hip joint caused by bony overgrowth that results in damage to the labrum and cartilage of the hip. The labrum is a fibrocartilaginous rim of tissue that essentially deepens the socket of the hip and improves stability. If the hip pops or locks, this may be a symptom of a labral tear. If a torn labrum is unstable and flips into the joint, this may cause rapid wear and loss of cartilage. A condition due to pieces of bone or cartilage floating around the hip joint. As the cartilage in the joint wears out, pieces of cartilage, and sometimes bone, can break off and create this condition. As people age, bone strength and muscle elasticity and tone tend to decrease. 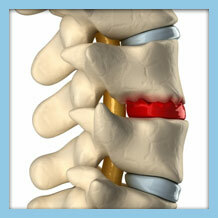 The lumbar discs begin to lose fluid and flexibility, which decreases their ability to cushion the vertebrae. If the spine becomes overly strained or compressed, a disc may rupture or bulge outward. This rupture may put pressure on one of the more than 50 nerves rooted to the spinal cord that control body movements and transmit signals from the body to the brain. A pinched nerve is a condition that occurs when surrounding tissue or structures compress the nerve and reduces its ability to function properly. The most common places in the spine that a pinched nerve occurs are in the neck or lower back. If the lower lumbar nerves become compressed or pinched, this condition is commonly referred to as sciatica. Radiculitis is not really a condition but terminology used to describe the neurological symptoms felt as a nerve is pinched, compressed, irritated, or inflamed. Although it is true that radiculitis can affect any nerve traveling out from the spine, it is most commonly seen in the lower back or the neck. Radiculopathy is a term that refers to nerve problems that have been left untreated in the spine. The problems are considered chronic and can be observed in any section of the spine, but are most commonly seen in the lower back or neck. Sciatica is a condition where the sciatic nerve has become compressed by another underlying spinal condition. Sciatica is a condition that will affect the lower back, with symptoms being felt through the buttocks, down the legs, and into the feet. Shoulder tendonitis occurs when there is inflammation around the rotator cuff tendons of the shoulder joint. The two most common causes of shoulder joint tendonitis are sports injury, where there is low impact repetitive damage to the affected area, or a sudden trauma to the shoulder. This condition is often painful and is caused by rubbing of a tendon around the hip joint over a bony surface. A spinal bone spur is a bone growth that has been formed as the body has tried to heal another problem. While not all spinal bone spurs will become problematic, when they do, the pain and other symptoms can become quite intense at times. A spinal bone spur can develop anywhere along the spine, but are most often problematic in the lower back and neck. Spinal stenosis is the narrowing of the space in the spinal canal that is reserved for the spinal cord and the nerves that exit this area. When this area becomes narrowed, it places pressure on the spinal cord and surrounding nerves leading to neurological symptoms. They might experience buttocks pain, cramps in legs, difficulty walking, and even sciatica. Sometimes the back and leg pain are made better when leaning forward and walking such as leaning on a shopping cart. Spinal stenosis is most commonly observed in the lower back and the neck but occasionally presents in the middle back as well. Spondylolisthesis occurs when there is vertebral slippage that has occurred in the spine. This means that a vertebra in the spine has slipped forwards or backwards onto an adjacent vertebra. Spondylolisthesis can occur anywhere along the spine but is most commonly observed in the lower back and the neck. 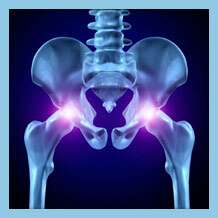 Inflammation of the hip lining tissue causing swelling, large collections of fluid within the joint, pain, and pressure. Tingling or numbness usually presents in more serious spine conditions. The partial or complete loss of feeling to one or all of your extremities is usually caused by pressure being placed on the corresponding nerve. This pressure can be caused by conditions such as herniated discs, sciatica, and a host of other conditions. This is a condition where the bursa (fluid-filled sack) around the hip joint becomes inflamed, commonly due to a tendon rubbing over the outside portion of the hip bone. Tumors (cancer) can grow fast. They can spread to your spinal (vertebral body) and spinal canal (where your nerves are). When this happens you may experience pain, numbness, tingling and even weakness. We can stop that. 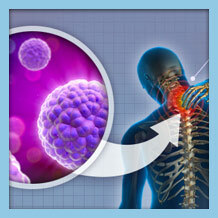 Our innovative and aggressive pain control methods can help control your cancer pain. An epidural injection is used to block pain caused by nerve impingement. The result is temporary but often used in conjunction with conservative treatment methods to provide short term pain relief. If therapy fails to correct the condition, other treatment should be pursued. Using advanced laser treatment has been shown to be more effective to stop facet mediated pain. A facet ablation or rhizotomy is a procedure performed to remove the sensory nerves that cause pain. These are the nerves that send signals to the brain telling it your back hurts. The laser essentially cuts that connection. No transmission, no pain. For over 50 years doctors have been performing facet blocks to treat facet mediated pain. With the addition of stem cells the blocks now are potentially a lot more powerful and more likely to leave you pain free. Stem cells can be harvested safely and painlessly from your body and then used in the facet block procedure to create a much more powerful and lasting nerve block. Arthroscopic procedures on the hip allow a surgeon uses a small optical device to view and work on the hip joint with a minimally invasive technique. An impar or Radiofrequency ablation procedure is performed to reduce or eliminate coccyx or tail bone pain. Radiofrequency burning of the nerves responsible for coccyx pain is safe and effective. This is a minimally invasive outpatient procedure, with no blood loss and is relatively painless. An impar block is an injection of medication that numbs and blocks pain signals from a damaged nerve in the coccyx or tailbone area of the spine. The results are temporary and as such an impar ablation is usually required for more permanent solutions. Stem cells are special cells in the body that can help the body heal and regenerate tissue. They can be harvested from your body safely and painlessly and then used to help particular areas in the body heal. Shoulder arthritis and tendonitis can be a painful and disabling problem. With the harvested stem cells and using a special concentration process we can place them in your shoulder for healing and relief. This is a new and exciting tool to repair a worn disc. With a small hidden incision near the tailbone a painful worn disc can be replaced and fused. This is relatively simple and usually bloodless procedure that can fix your back. It offers a quick recovery, less pain, and minimal visible scars for a full fusion. Cervical disc replacement is an amazing new technology performed to replace a damaged, herniated, or painful disc while maintaining motion in the spine. 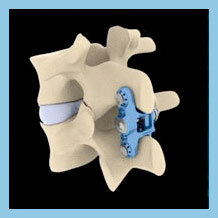 Instead of performing a traditional spinal fusion, an artificial disc is inserted to replace the old damaged disc. 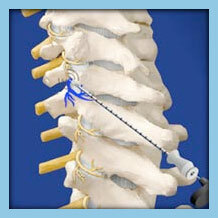 The new disc actually moves and is designed to not reduce any motion, a problem common in spinal fusion procedures. A very small incision is used to allow surgeons access to the affected area. The disc material is removed safely through a painless laser procedure or a very small grasper/biter. The technique is simple and bloodless under our expert hands. Patients are comfortable throughout the procedure and are able to go home the same day. 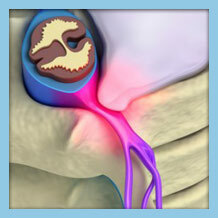 An endoscopic foraminotomy is performed to remove debris from a clogged foramen. By removing the debris, a compressed nerve is released and painful symptoms are relieved. An endoscopic foraminotomy is performed as an outpatient procedure with the patient being encouraged to walk following the procedure. Recovery time is minimal and most people are back to work within the week. A facet fusion procedure is the most reliable form of treatment for facet pain. The procedure is performed to permanently cure facet mediated pain. A spacer is placed into the facet joint to stabilize it and stop the joint from rubbing on the nerve, and thus stops the pain. This is a simple outpatient procedure with a quick recovery; most patients are back to work within a week. Interlaminar spacers, like X-stop (Medtronic) and ILIF (NuVasive), can help treat central and foraminal stenosis minimally invasively in some instances. The spacer is surgically inserted at the affected segment of the spine to hold it in a degree of flexion and provide a larger area in the spine, relieving the stenosis. This removes the pressure from the nerves and reduces or eliminates the pain and symptoms completely. 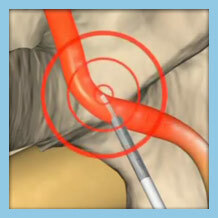 A microdiscectomy is a surgery performed with the aid of microscopic lenses. The incision is a little larger than that of an endoscopic discectomy, but smaller than traditional open back discectomy. A microdiscectomy can be performed as an outpatient procedure, with most patients being discharged on the same day of the procedure, although very rarely a patient may be required an overnight stay in the hospital. 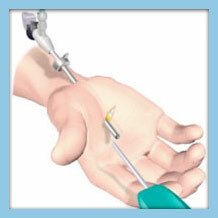 We perform an outpatient percutaneous release of the pinched median nerve. It is safe simple and allows you to return to activity almost immediately. The incision is smaller than a postage stamp, and there is no appreciable blood loss. 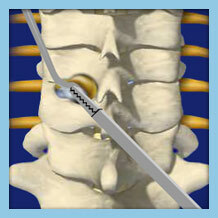 A percutaneous discectomy is the most minimally invasive technique possible used to surgically treat disc bulges, protrusions, and small contained herniated discs. There is no blood loss during the procedure and can be performed in an outpatient environment with most patients returning to work within a week. A small incision is made and the arthritic shoulder joint is exposed. The arthritic areas are scraped away or removed and covered with an implant. The glenoid, or opposite side, sometimes is also treated with a “graft jacket” to cover it and protect it from continued wear. This surgery is generally done as an outpatient procedure with little to no blood loss. When the spine’s discs wear our there is often associated pain and collapse of that disc causing nerves to become pinched. Pain from pinched nerves or arthritis to the disc can be severe and disabling. This is a problem that can be fixed with a new approach. STEP 4How Can OLSS Help? Confirm your condition for free and receive a complete evaluation of your prescribed treatment against a wide range of treatment options. Traditional orthopedic surgical procedures can require long periods of recuperation, and result in unsightly scaring. OLSS employs the most advanced and minimally invasive techniques while treating your pain allowing you to recuperate from your treatment faster with less scarring or bruising. Our doctors specialize in minimally invasive procedures and pain management treatments. We offer a comprehensive program that uses the latest in research, technology and treatments – from non-surgical treatments to gentle, minimally invasive surgery with an incision smaller than a postage stamp. If you’ve had any recent diagnostic tests, why not put them to good use? This tool enables you to easily and securely send us those results, where they will be reviewed by a certified orthopedic specialist. If you need a diagnosis, a second opinion, or a treatment recommendation, let's discuss your next step. My name is Tammy and I’m so overjoyed to write this testimony about Doctor Katzman and his staff at 652 Palm Springs Drive, Altamonte Springs, FL 32701 who performed my Coccygecomy on January 6, 2014; after years of pain. It all started 20 years ago when I was diagnosed with a stress fracture on my tailbone while I was 7 months pregnant. My name is Paul and what I’m about to tell you could change your life, like it has mine. Imagine bending over to pick up a coin, look under a shelf, take out the trash, walk your dog, or just going to Wal-Mart for milk and bread, things people do every day with no problem. Right? I would like to thank you for the caring, quality treatment afforded me by you and your staff, before, during, and after my lumbar surgery to treat my right leg sciatica problem. The surgery is amazing, requiring no hospital stay and leaving almost no scar! I am extremely happy to have relief from my pain. Sorry that is has taken so long for us to contact you to thank you for how much you helped us in correcting Ron’s back problem. Over the past five years there have been several physicians . . . some good, some bad, and a very special few, extraordinary. I am pleased and honored to report to you that I am 100% pain free. The artificial disc replacement laser surgery that you performed on Friday, September 5, 2013 was a lifesaver. I was able to return to work on Monday, September 9, 2013 with no restrictions whatsoever. I am pleased to report that you that I am doing well. After about 8 weeks I was able to start some hiking. Now when I get on the trail, the first thing I think of is that I cannot believe I am able to do this. I have suffered for 8 years with back pain and the only thing that was done was cortisone injections to decrease the pain. I will report that I am not pain free but manageable. Mary, who has worked within the medical spine service team for over 6 years, unexpectedly but thankfully, becomes a patient: I have always been amazed to see and talk to the patients smiling at me and walking straight up without any pain after a post op visit. I have had a lot of vascular problems and surgeries so I never thought I would be able to be one of Dr. Katzman's surgical patients. On August 15, 2012, Mr. Rick Mayo came to Dr. Katzman's office with complaints of severe neck pain with left arm radiculopathy (pain and numbness). After reviewing Rick’s MRI, Dr. Katzman observed a large left sided herniated disc at the C6- C7 level with protrusions at the C3-C4, C4-C5 and C5-C6 levels. He was also developing stenosis which is a narrowing of the opening where the spinal cord goes through.